Industry leading cargo tank coatings for chemical & product tankers. Industry coatings engineered to protect your assets. Protection against strong acids, solvents, caustics and other chemicals. Tanks, clarifiers, flocculation basins, etc. ChemLINE® Caulk is a two (2) component 100% solid material manufactured with the same polymer as ChemLINE®. ChemLINE® Caulk is supplied in complete small sized kits for quick and easy repairs of caulk, joints, and coving prior to application of ChemLINE® coating system. For product recommendations and technical, application and heat curing information contact Advanced Polymer Coatings' customer service. Contact +01 440-937-6218. 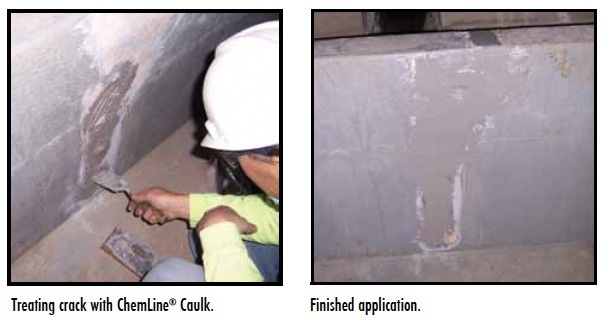 ChemLINE® Caulk is a tough, chemical resistant material for concrete flooring and secondary containment applications. This product is used to fill cracks and joints, and serves as a material for coving uses. It is designed to be top coated with ChemLINE® coating system. Can be applied at horizontal thickness up to the 1" lift. Additional lifts can be applied after B-stage.